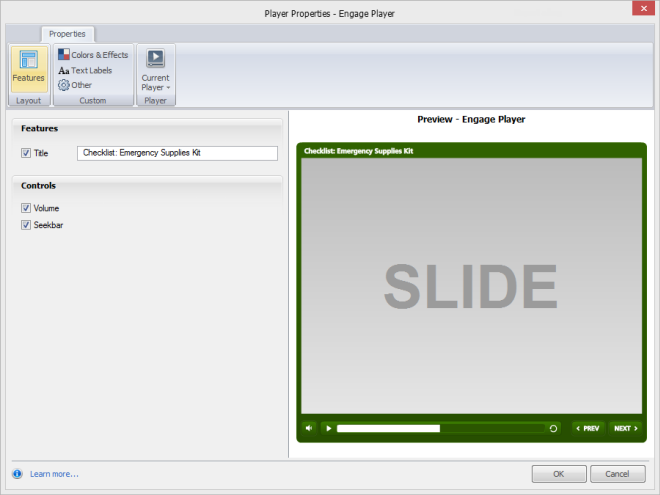 Articulate Engage lets you choose which options and controls you want to include on your interaction player. To customize the player, click the first tab on the Engage ribbon (its name corresponds to the type of interaction you're using), and then click Player. When the Player Properties window appears, the Features button will already be selected, and you can begin choosing your preferences. As you make changes to the options on the left side of the window, keep an eye on the Preview area on the right side of the window. It'll reflect your choices, so you can decide whether you like the changes. When the Title box is marked, the title appears in the upper left corner of your player. If you don't want to display a title on your player, uncheck the Title box. Tip: You can also change the player title when you publish [link to Previewing and Publishing and Interaction]. Volume: If this box is marked, a volume slider will appear in the lower left corner of your player. Seekbar: Mark this box if you want to include a seekbar at the bottom of your player. The seekbar automatically includes play/pause and rewind buttons. What About Navigation Controls, Such as Prev and Next Buttons? Interactive: If you choose this playback mode, you'll have the option of displaying or hiding the Prev and Next buttons. Mark the Show previous/next buttons box to add these buttons to your player. Linear: With this playback mode, the Prev and Next buttons will automatically display on your player. They can't be hidden or removed. Presentation: When you choose this playback mode, the interaction advances by itself. There won't be navigation buttons on your player. If you'd like to change the wording used on the Prev and Next buttons, see Changing the Player's Text Labels. 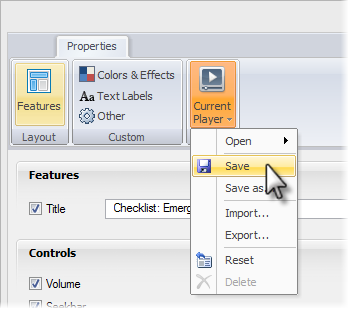 If you click OK on the Player Properties window and then save your interaction, Engage saves your player customizations within your interaction file. It's a good practice, though, to save your player separately so you can easily apply the same player customizations to other interactions. For more details about using the Current Player options, see Saving Your Player or Switching to a Different One.